Holy Pabellon Batman! VIVA AREPAS is Terrific! ELV knows as much about Venezuelan cuisine as he does about Lagrangian mechanics, but that doesn’t mean he can’t appreciate a succulent wood-roasted chicken, crispy fried yucca, sweet and satisfying fried plantains, and a frijoles negroes con queso to beat the band. As our loyal readers know, we consider most re-fried bean dishes to be a bad joke, but these had us licking our plate — as did the three separate sauces coming out of those squeeze bottles. Two of them (we think) are variations on guasacaca — a classic Venezuelan accompaniment — and although the presence of avocado was much less evident than were the herbs and chilies, so fresh and brightly flavored were they that we’d put them up against any salsas in town. Truth be told, we’ve never been a big fan of the bread-y and heavy arepa “sandwiches” which are most people’s introduction to this cuisine. But if you’re looking for an alternative to Cuban food (which this closely resembles), with similar raw ingredients given more zing, beat a beeline to Las Vegas Boulevard South and Oakey and watch the world go by in an open and friendly restaurant that adds more spice and more careful cooking than any Cubano in our humble burg. Our lunch for two came to $24, including tip. Charlie Trotter Wishes ELV a Happy Fifth Birthday! Well-deserved praise for a truly special spot. I got a terrific exposure to Venezuelan cuisine over several years of doing business there a decade ago, and have missed the ubiiquitous Arepa, which was such a staple. So many times when we visit ethnic restaurants in the U.S. they are pale imitations of the genuine product, but that is not the case here – these are actually better than anything I had in Caracas or Maracaibo. Bolder flavors and first-rate ingredients really do make a difference (you get about 40-50% more inside the Arepa than at a Venezuelan street stall), and the passion of Felix and his crew really shows. A gem. Damn! It’s been discovered. Was hoping I could keep Felix to myself for as long as possible, but he deserves as much business as he can handle. If you can catch his hotdog/taco stand open a block over, it is great too. He is making his own sausages and the adobadas tacos are a worthy rival to Tacos El Gordo. Agreed. 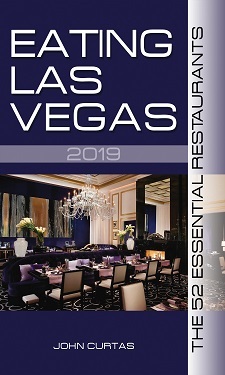 Felix is a great chef and a wonderful addition to the amazing food choices in Las Vegas. Like Sheridan Su at Fat Choy, Felix is making food with personality and passion. Asking for a double-check on the address. Google streetview shows what appears to be a different building entirely–a donut shop that also sells Chinese food, next to an Arco. It is actually right across the street from there – 1616 Las Vegas Blvd. Those that stop by these days can also see that they have also started to transform the space next door into a Gelateria. So pretty soon we can douse even more of the hot sauce on an arepa or the chicken, knowing that there is a nice, sweet palate cleanser afterwards.